178 Nov 28/12 Northern Lights at the farm. Long exposures, a near full moon and a yard light lit the yard. Wow, this is sooo wonderful - especially with the contrasting red barn!!! I want to see these in person some day, great catch! Lovely - what a nice postcard this would make! Absolutely amazing shot! 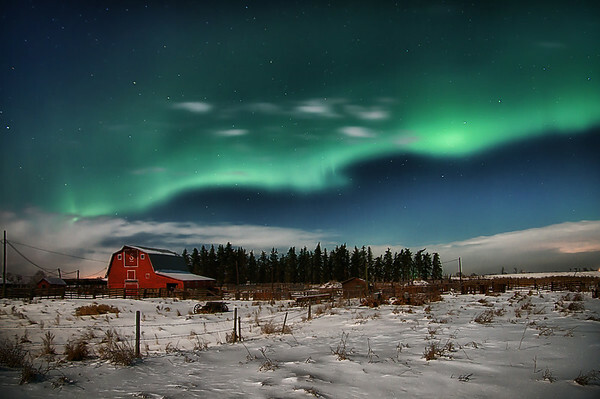 You so rarely see much other than the Northern lights in the sky in shots of these, so, to see them behind the barn and trees and to have the fence show up, as well as the snow detail is really astounding!